Longtime National Lampoon contributing cartoonist Gahan Wilson is suffering from dementia. His step son, Paul Winters, has set up a GoFundMe campaign to help fund his memory care. Click the link if you want to help. Wilson is known to NatLamp readers for his warped, often macabre sense of humor. He did many covers for the magazine, as well as feature articles, cartoons, and the long-running, autobiographical comic strip Nuts. 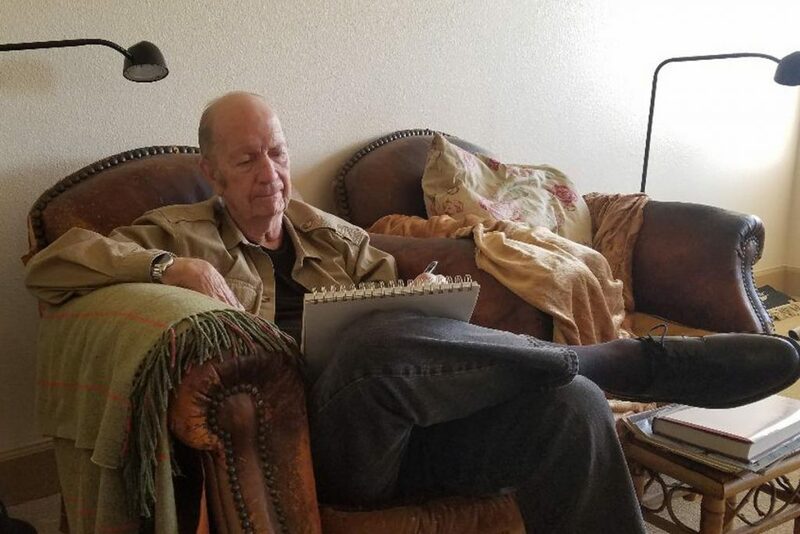 Robert Grossman, the prolific and talented illustrator and caricaturist, died on March 18, 2018, at the age of 78. 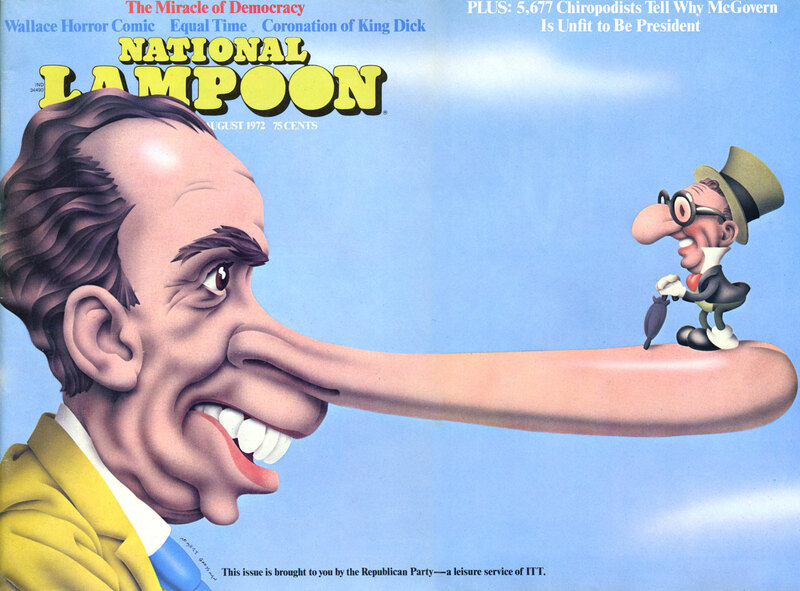 He did several covers and other pieces for the National Lampoon over the years, most famously the fold-out cover depicting Richard Nixon as Pinocchio for the August 1972 (The Miracle of Democracy) issue. I actually met Grossman once. He sat next to me at the National Lampoon Event at the New York Public Library in 2010, the one publicizing the publication of Rick Meyerowitz’s book Drunk Stoned Brilliant Dead. We talked a bit, and he said that he knew of my Lampoon website. He even remembered (when I brought it up) the time I hired him once when I was a magazine art director back in the ’80s to do an illustration of the Statue of Liberty with a punk hairdo. At one point, he asked if I had any paper. I tore a page out of the notebook I had in my pocket and gave it to him. A minute later he handed it back. 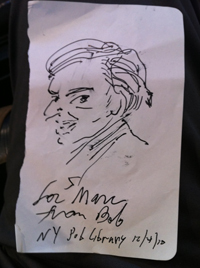 He had drawn a caricature of me! It’s a little bit rough because he didn’t have a good surface to support the paper, just the palm of his hand. Even so, it looks just like me. In every issue I’ve seen (until now), page 84 was a full-page ad. I always assumed this was an intentional joke. Considering that the gender of the cover model has been called into question almost since the issue hit the stands (alluded to on the Editorial page of the December 1974 issue), it’s not hard to imagine that it was done on purpose, just to mess with readers. Except… there really was a page 84. Reader Jeff Goodman alerted me to a discussion on the CGC comic book collectors’ forum regarding the gender of the model on the cover. It’s kind of amazing that people are still discussing this after all these years. On the other hand, I’ve never been totally sure one way or the other myself. I joined the discussion and asked him to post a scan of the entire page, which he did (click on the image above to see it). Not only does it contain the rest of the cover description, it also includes an errata concerning the 1964 High School Yearbook parody and the rest of the Letters From the Editor column, which was also cut off with a “continued on page 84” slug, and a different half-page ad. 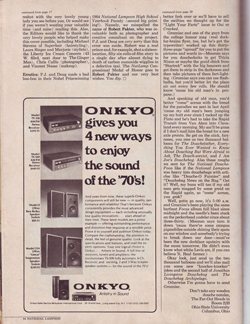 My guess is that the full page ad was either a last minute addition or had been accidentally left out of the issue and was a big enough deal that they stopped the press run to get it into the issue, dropping the original page 84, including a smaller ad. I used to work in the magazine business, and I can vouch that these things do sometimes happen. Considering the fact that it has taken so long to discover this fact, I would also guess that issues with the original page 84 are not common, which would mean that they made the change early in the print run. Thanks to OtherEric and Jeff for their part in uncovering this missing bit of NatLamp history. I just feel bad for Robert Pakter. The May 2017 issue of Vanity Fair featured an article by Benjamin Wallace called “Can Anyone Repair National Lampoon’s Devastated Brand?” (online version here). I was alerted to its existence back when the issue was still on the stands (thanks to reader Logan Lee), but I put off reading it, dreading a depressing read. I wasn’t wrong about that. 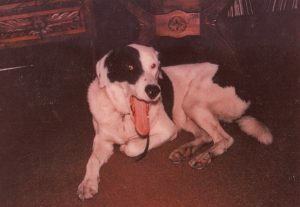 I started Mark’s Very Large National Lampoon Site back in 1996. At the time, I didn’t know if National Lampoon was even in business anymore. But I soon found out that it still existed, albeit a shadow of its former self. Somehow, it’s not in any better shape now than it was then. The Vanity Fair article chronicles the Lampoon from around that period to the present. Some of it I’ve learned of as a consequence of running this site. Over the years, I’ve corresponded occasionally by email with some of the folks featured in the article—Dan Laikin and Scott Rubin in particular. But for the most part, it has been a distant sideshow for me. It never seemed like what they were doing was likely to amount to much in terms of reviving the Lampoon name. If they succeeded, cool. But my interest has always been with the early years of the magazine. The article connects bits and pieces I’ve picked up in the two decades of doing this site, stuff I honestly hadn’t paid all that much attention to. Things always seemed kind of shaky over there, but it sounds like it was even worse than I’d imagined. As a former staffer is quoted as saying, the joke around the office was that they were all in a movie called National Lampoon’s National Lampoon. So, if you’re wondering what the hell happened to your favorite humor “brand”, be sure to check it out.